Remember the M4? We've seen glances of a spec sheet, but now we get to see how it's going to look. Courtesy of @evleaks, we can now tell it's looking good. After the critically-acclaimed One, the company looks to be sharing its style tips around -- at a glance the M4 appears almost identical to the HTC flagship, although the camera flash has been relocated to the center of the device and there's a few less micro-drilled speaker holes. Running over the leaked specs, you can expect a smaller 4.3-inch screen at 720p resolution and possibly a cheaper build to the unibody beauty that leads HTC's smartphone family. 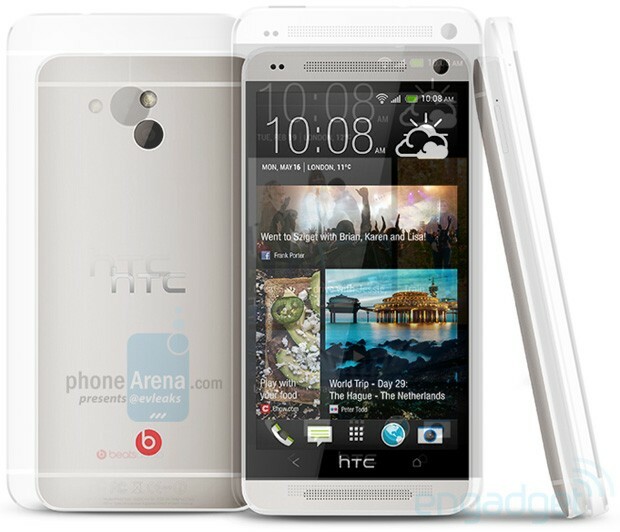 There's likely to be a dual-core processor, LTE-capable radio and 16GB of storage too. There's better news, with the UltraPixels-packing 4-megapixel camera sensor rumored to make its way into the middleweight phone, although initial leaks pointed to a 13-megapixel sensor. The phone is said to be appearing later this quarter, but we're still waiting on official word (and that all-important price) before we get too excited. But hey, it worked for Samsung. Update: We've made a couple of comparison images of this rumored M4 with the 4.7-inch One. Check them out after the break.